Just like the adults wear, this children's yukata celebrates longevity and happiness. 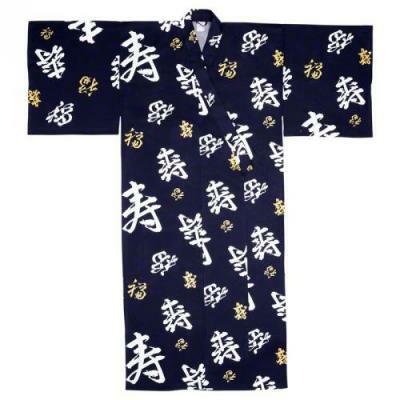 This boy's Japanese robe features bold white and gold calligraphy symbols on a navy blue background. These artistic symbols represent longevity and happiness. This children's yukata is made in Japan of 100% cotton with a shrink resistant finish. Easy care and machine washable, cold water for best results. A matching belt is included. This yukata robe has straight sleeves. This youth-sized yukata is available in four sizes: 30, 35, 40 and 50. Sizing Help: Measure with a tape measure from the top of your shoulder and down the front to determine where the length would fall on the person. 30, measures 30" in length and is designed to fit a child with a height of 3' 5" to 4". The sleeve length is 9", the shoulder width is 13" and and the wraparound waist adjusts up to 26" and ties with the matching belt. 35, measures 35" in length and is designed to fit a child with a height of 4'" to 4' 4". The sleeve length is 9 3/4", the shoulder width is 14 1/2" and the wraparound waist adjusts up to 30" and ties with the matching belt. 40, measures 40" in length and is designed to fit a child with a height of 4' 5" to 4' 8". The sleeve length is 11", the shoulder width is 17" and the wraparound waist adjusts up to 32" and ties with the matching belt. 45 (+$5.00), measures 45" in length and is designed to fit a child with a height of 4' 9" to 5' 2". The sleeve length is 11", the shoulder width is 18" and the wraparound waist adjusts up to 34" and ties with the matching belt. 50 (+$5.00), measures 50" in length and is designed to fit a child with a height of 5' 3" to 5' 7". The sleeve length is 11 1/2", the shoulder width is 20". The wraparound waist adjusts up to 36" and ties with the matching belt. These Japanese robes will vary from knee length to ankle length depending on the height of the youth. My son received this for his birthday and wears it everyday. It's lightweight and he loves it.